Back in Manchester after the Munich trip and I as out for a run around Fletcher Moss this morning as soon as it was light. We don’t start back at work until tomorrow so we’ve had a full day to get ourselves sorted before the final onslaught as we charge towards Christmas shutdown. As soon as I set off this morning it started lashing down. Hefty, icy raindrops pelted me for the first ten minutes but then the sun came out, a rainbow wrapped over a slate-grey sky and sploshing through the lanes became more fun. 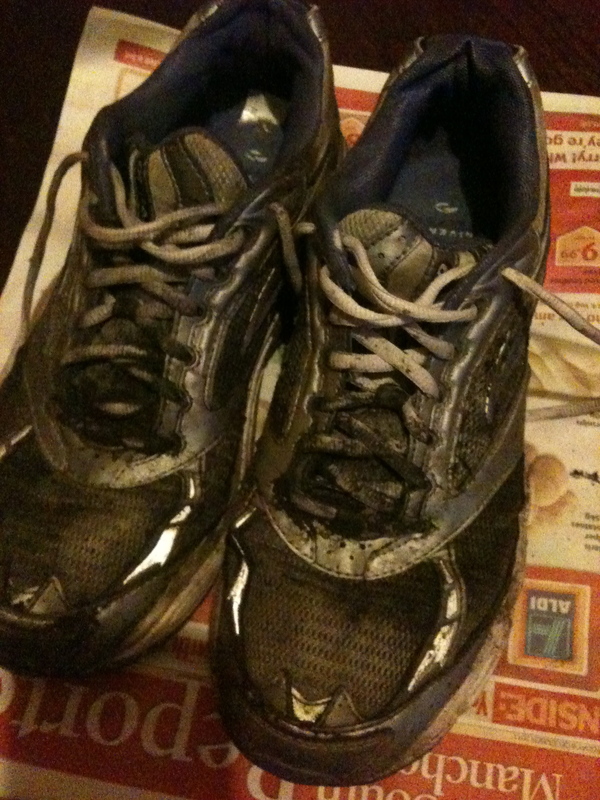 Nearly lost a running shoe in one puddle. Will they ever be clean again?! And you should have seen the state of my feet. I looked like a mudlark by the time I’d got home. I ran three miles – one at 11.20, one at 11.38 and a third at a dismal 12.45, coming in at a shocklingly slow 35.14. That second to third mile really kills me. But my skin is zinging after a trot through the rain, I swear it’s better than any facial for glowing skin. Harry the personal trainer’s off to Canada to see family for Christmas so I’m hoping I get one session with him before he heads off. This week I’ll be doing short, nippy runs, I reckon. The weather is not set to improve. Running is all about challenging yourself isn’t it. Trying to be faster, trying to be stronger, trying to be better. I do like being able to improve at something that is so flaming difficult. I’m sure people who don’t do it think it’s easy. But it’s rock hard, physically and mentally. It’s fun but oh so hard sometimes. Today I did long interval training for the first time. And while I knew I wouldn’t be doing it if Harry didn’t think I could and I knew it was not going to kill me even if I couldn’t, still there’s that niggling little voice saying ‘no’. Fear of failure; pointless and yet so potent. Interval training plays a big part in getting you faster. Running fast and then running slow gets your body and lungs used to working at a faster pace. I’ve done short intervals on and off as part of my weekly runs, but nothing this long – 2 mins at a challenging pace, 3 mins jogging, multiplied by 6. As the longest interval I’ve ever done is 1.5mins, and that’s once in a set of five, I was reticent. And I have to say, the first interval wasn’t fun, the second was great and then the third was hard and the recovery tricky. By the fourth I was wheezing through my recovery and by the fifth recovery I was having to walk some of it while Harry skipped about beside me. Weirdly though the sixth was ok again but we dropped the pace for that one. Harry was shouting lots of ‘brilliant, you’re bouncing along there – soft knees, soft knees’ while I kept looking ahead trying to find something to aim at on countdowns. Two minutes can feel like for… ever. After 40 minutes of that we did some lunges with the medicine ball, squats, one-legged squats and some strange plank thing where you put your hands on the medicine ball and lift one leg up in the air behind you. Then a quick run up and down a flight of steps six times (kills your glutes) and we were done. Of course he’s not going to push me into anything I’m not ready for, if I think about it logically. But what has logic got to do with fear? And the little triumphs I get to score over my niggling ‘no’ voice are just one more reason for me to keep running. 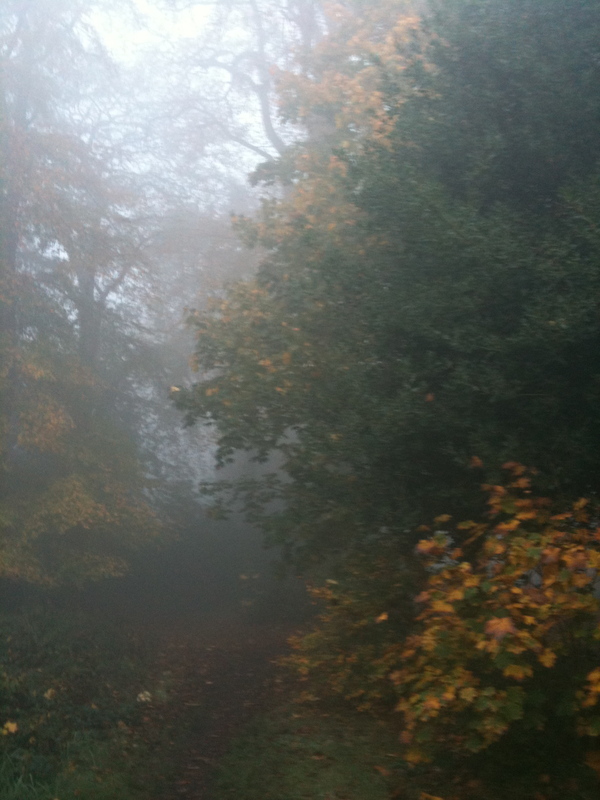 As some shady ne’er-do-well would say in a Sherlock Holmes mystery ‘Cor, blimey, it’s a right pea souper out there’. Foggy this morning, super foggy. 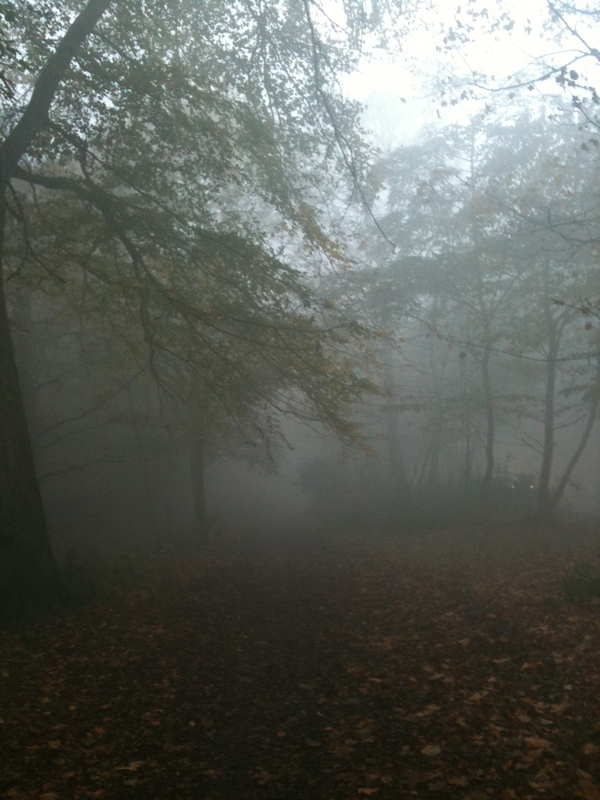 Dead atmospheric though and all those fairy tale heroines flashed through my mind – Gretel, Little Miss Riding Hood – as I walked up to the park for personal trainer morning with Harry. Every sound is amplified in fog, or maybe your senses are just more alert, but I heard the leaves falling. The colour-contrast of leaves was just lovely still, but even though it’s 7.30am I am not the only one up. 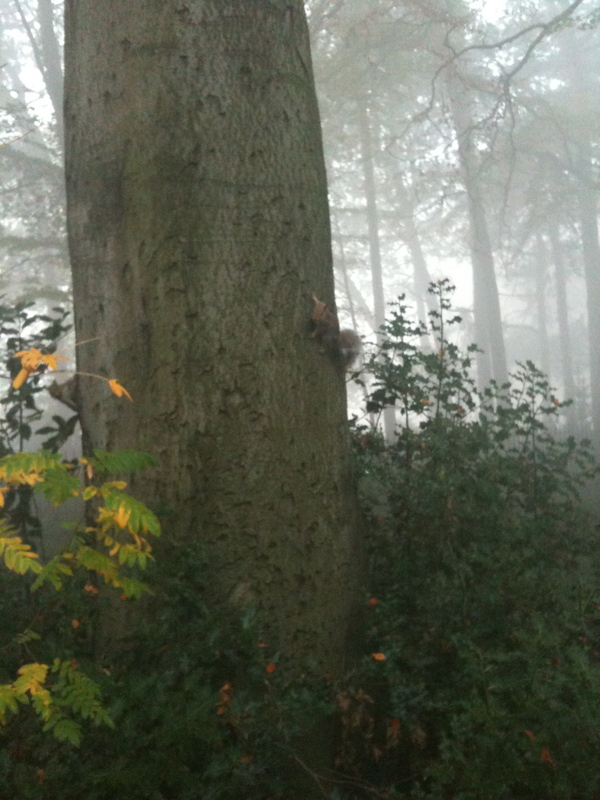 Don’t know if you can see but the little grey smudge is a squirrel who was charging up this tree with his mate. 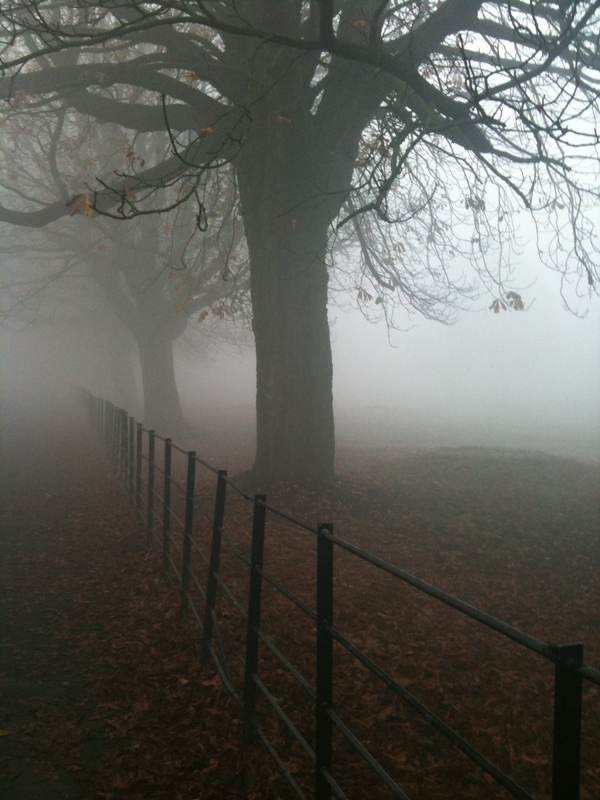 And at last I get to the park, equally masked by layers of fog. I’ll update on what I actually did with Harry later today – I’m off out for lunch at the Yang Sing in town today. We’re meeting up with some old friends of mine who live on the Wirral and I need to get some make up on.